Is The Rockville RPG2X10 Package PA System A Good Entry-Level Option? 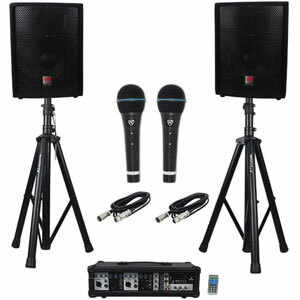 A slightly more comprehensive kit like the Rockville RPG2X10 Package PA System is always an appealing starting point for anyone new to motivational speaking or the gig circuit. This PA sound system doesn’t have all the fancy extras and connections of some of the top-of-the-line models around. But, it does have a user-friendly mixer, speaker stands and two microphones. It looks like their should be plenty of potential here, but what do users actually think? 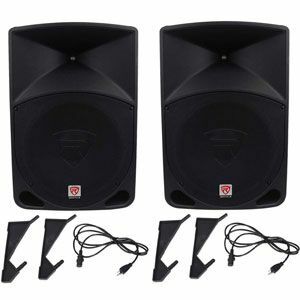 Does The Budget Rockville RPG122K PA Speaker Kit Have All Users Need? 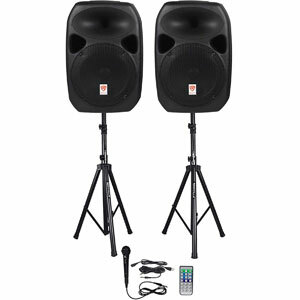 The first thing that buyers see with this Rockville RPG122K Dual 12″ Powered DJ/PA Speakers kit is the amount that they get for their money. This isn’t a particularly expensive system, not compared to some of the well-known names around. Yet, there is a definite beginner’s kit here. There are two speakers – one active and one passive. They come with their stands, as well as all the appropriate cables, a remote control and a microphone. This means that it should be easy enough to get set up. The question is, are all those components good enough to meet the needs of users.